Many people hear of celebrities joining sororities, but never get to see pictures of this historical event. Here we feature a few pictures from the celebration of Soror Alicia Keys and her selection as honorary member of Alpha Kappa Alpha Sorority, Inc. The pictures are OH SO PRETTY! Soror Keys is pictures here with our beloved Former International President (the 26th) and IBTW, Linda M. White and others. 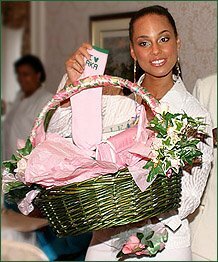 Soror Keys is pictures here with a basket of paraphenalia (we can all relate to getting your first piece of “AKA gear”). Soror Keys takes some of her first pictures as an AKA! Pictures like these help us all remember when we became an AKA. Whether our favorite pastimes are gettings to know our Bigs, going through MIP, or planning our first program, being a member of Alpha Kappa Alpha Sorority, Inc is something we shall all never forget. Honorary membership is no different! Honorary membership is THE highest honor that the organization can give. I wanted to write you one bit of remark to help say thank you yet again for your pretty advice you’ve contributed on this site. It’s simply unbelievably generous of you to grant openly just what a number of us would’ve marketed for an electronic book in order to make some cash for their own end, specifically considering the fact that you could have tried it if you ever decided. The pointers additionally worked to become great way to be sure that someone else have the identical passion just like my own to find out a whole lot more around this condition. I know there are a lot more pleasurable periods ahead for those who look over your site.